Long weekend trip to La Push. September 21st - 24th 2015. Was wanting to take a trip after completing my general exam. Another long weekend trip, I caught the Dungeness line here to Port Angeles. The same evening I had planned to make it to the campground at the far end of Crescent lake, along the 101. The bus arrived a bit late, and the cycling was a bit slower than I anticipated. I made it to the east end of the lake just in time for it to start to get dark. The campsite was at the other end of the ~10 mile lake – perhaps another hour’s ride. The road by the lake turned out to be winding, with literally zero shoulder and, beyond a metal barrier, at times a fair fall down to the lake below. During daylight it’s precarious enough of a bike ride to warrant flashing warning lights to drivers, notifying them there are cyclists on the road. Such warning lights are common over bridges and tunnels that cyclists often use, however this was my first encounter with such signs. With the fading light I in fact rode right past the button to turn on the warning lights. Had I noticed the button it would have acted as a good warning to myself that I was about to cycle something a bit iffy. What followed was my lesson in the importance of researching routes beforehand. Being the 101, there were still large trucks passing me as the daylight continued to fade. My bright clothes and small flashing rear light were entirely inadequate for the route I found myself on. Given the winding nature of the road my progress was slow. I realized it would be completely dark long before I was going to make it to the campsite. There was really no where to pitch a tent, since over the road barrier things just fell quite quickly down to the river. Nonetheless, I had to get off the road. I stopped and threw my stuff over the barrier, and found a small space on the bank of the lake I could pitch a tent. There were plenty of good places to pitch a tent along the 101 before I started on the lake. I felt pretty stupid for getting myself into a dangerous situation. The rest of the trip was without incident. I continued on to Forks, then to La Push. 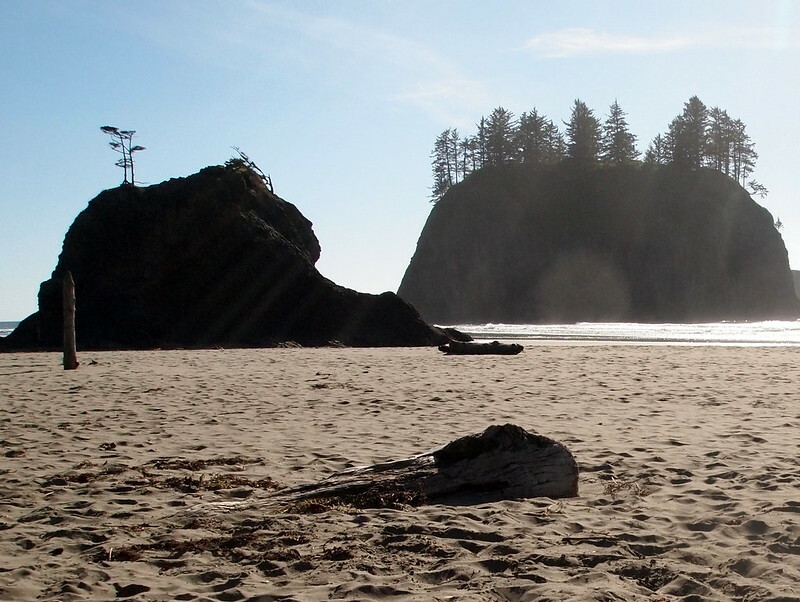 I hung around La Push for a day, reading a bit, eating at the only restaurant nearby I could find, before cycling back the next day. Weather was mostly good, given the time of year, though it did rain on the ride back. There are other routes around Crescent lake, that I know of now. At the time however, with the visitor center being no help, I just defaulted to the 101. © 2019 Ben Lansdell. Powered by Jekyll & Minimal Mistakes.